It's Time To Tailgate, Are You Ready? Gathering before sporting events for food, refreshment, and discussion has long been a source of goodwill and fun times. 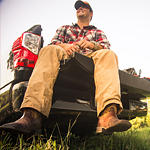 It's an opportunity to create some great moments and experience great food from the tailgate of your pickup. There are a number of tips to know that can make tailgating more pleasurable. There is a lot that goes into a great tailgating event. Planning ahead can be advantageous in helping things run smoothly. For instance, you should slice and pack your burger toppings to avoid having to do so at the event. Another tip is to label your coolers so that your friends and guests don't have to hunt for drinks. There are a number of tips to that can help you plan for and execute your next tailgating adventure. Another thing you should do before heading out is to make your pickup is in great shape. To get it serviced, please visit us at Jeff Smith Kia.